Six and a half years ago, I put up a post about the special little gravel patches on Dunsmuir Ridge. On Tuesday I finally returned there to put back the rocks I collected. That’s extremely fussy of me, but a principle’s a principle and my living space refuses to stretch with the rocks I bring home. 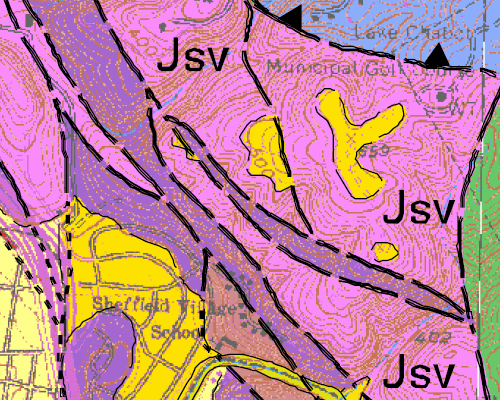 I didn’t include a geologic map in my earlier post, so here it is now. The gravel patches are shown in light tan, inside the “Jsv” area (which you’ll recognize as the Leona “rhyolite”). The straightest black dashed line is the Hayward fault. 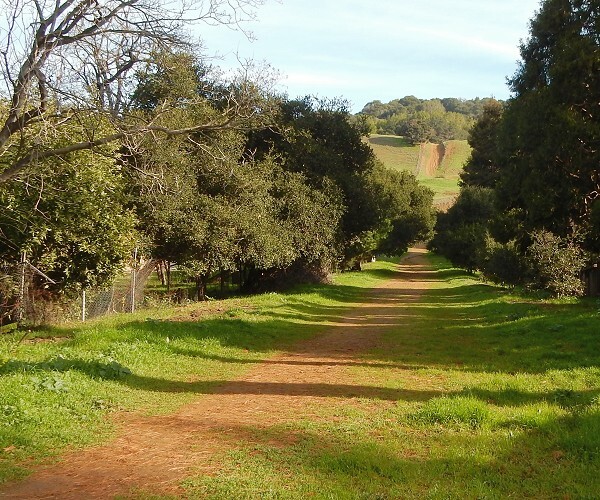 Winter is a good time to walk Oakland’s hills. The Leona makes up the country rock, distinctive yet somehow nondescript. As you climb through the woods, the stones in the road turn rounded, and variegated. That’s the odd, out-of-place gravel. 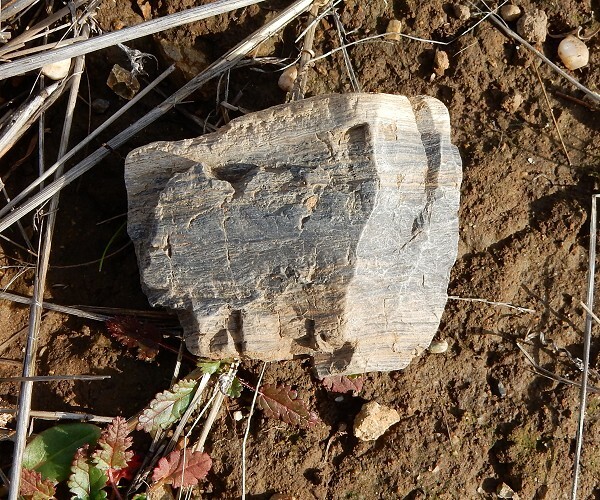 Here’s a hunk of the laminated Claremont chert, well outside its domain. 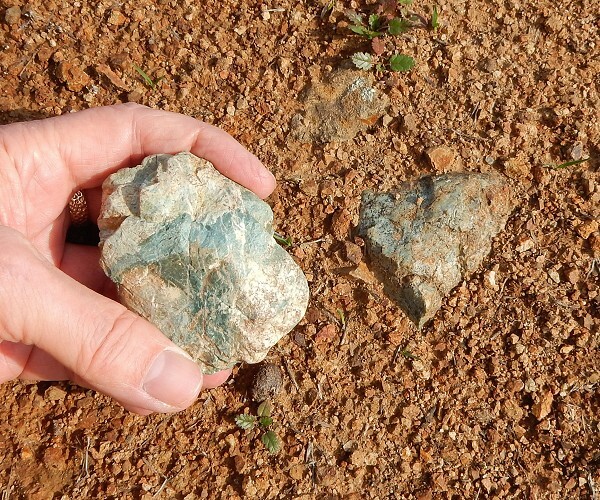 As I encountered each lithology, I pulled out the appropriate cobble from my 2009 raid and reintroduced it to its cousin: the celadonite-bearing Leona, more abundant in the gravels than in the field . . .
and the glorious Franciscan metachert. 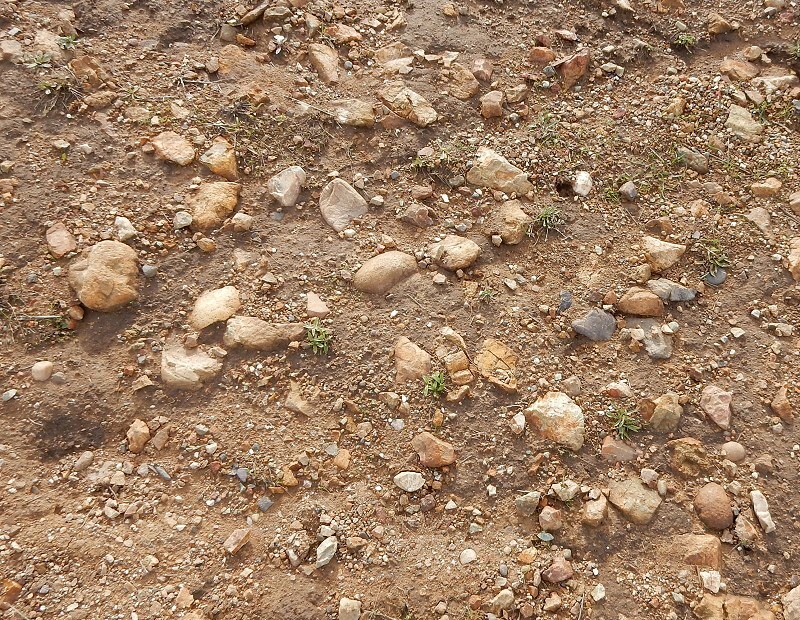 When all the stones were dispersed, I went up to the hilltop where the gravel had been so abundant in the roadways in 2009. I knew what to expect. This part of the hilltop is no longer fit for science, but I’m not bothered. Real science would be done by careful excavation in undisturbed places, and those are still available. Meanwhile, you could say those rocks are now cherished stones. Rainwashed and sundried, they look their best now. Enjoy them while you’re up there. My second purpose in revisiting Dunsmuir Ridge was to compare its gravel to the official Irvington Gravel down in Fremont, which I did that afternoon. 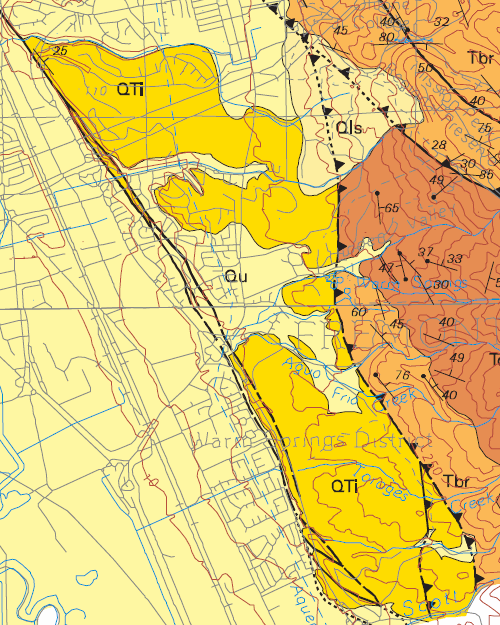 Here’s the geology, from the Alameda County bedrock map, USGS Open-File 96-252. It’s not a great map for field use — the geographic base layer is quite poor — but you get the gist. I-680 curves east through the northern tip of the gravel, and the original quarry is right there where the “25” is. The ex-quarry and the streambed along the north edge of the gravel are preserved in Sabercat Park. It was an ordinary gravel quarry until the 1940s, when a treasure trove of Pleistocene fossils was extracted from the site. 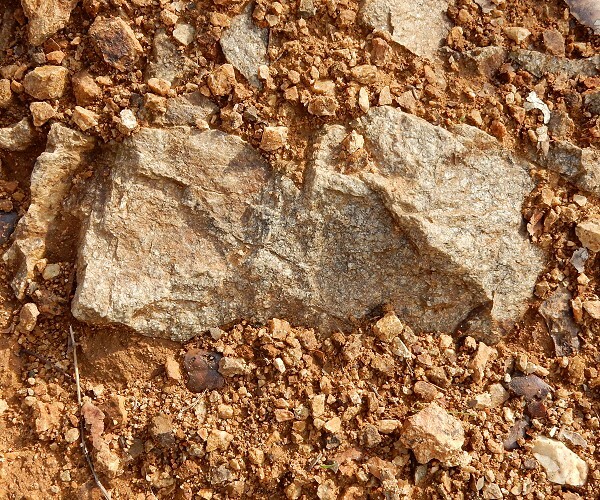 More fossils are surely there, thousands of them, in the hillsides. I took a good look at the gravel cropping out. There was a general resemblance to the Dunsmuir Hills patches that I wouldn’t have noted had I been a naive visitor. But for an initial reconnaissance visit, this was cool. 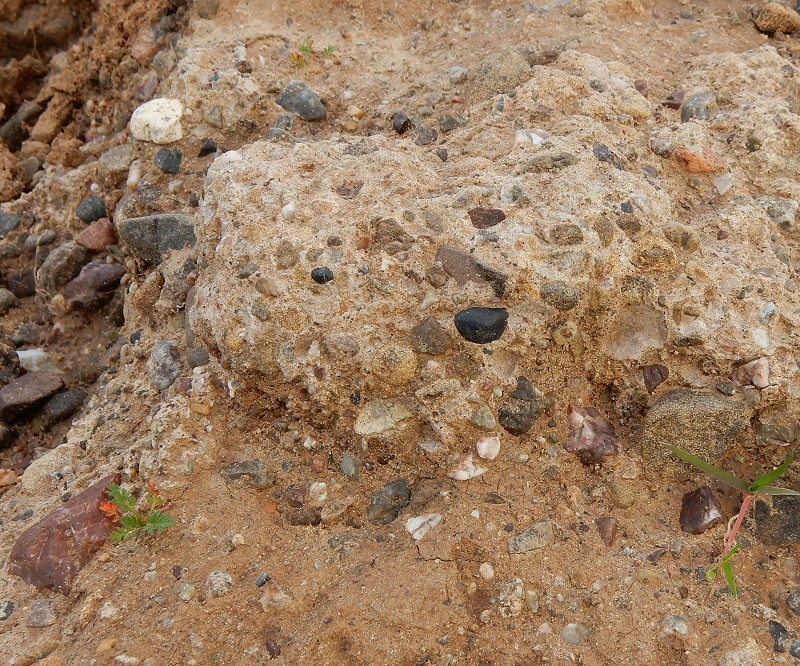 Fossil hunters adore the rain, because it gently washes dust and dirt away from even tiny fossils, allowing them to stand out on the clean surface. So I closely inspected a few spots just in case there were, like, Pleistocene mouse teeth exposed. Just some pretty Franciscan chert again. Parks are off limits to collectors, so I would have merely photographed anything I found. I’ve come to believe that finding is a purer pleasure than keeping, anyway. The Northern California Geological Society had a field trip here 10 years ago. Many wonderful Irvington fossils can be seen and touched at the Children’s Natural History Museum in Fremont. This entry was posted on 18 January 2016 at 8:03 am and is filed under Leona volcanics, Oakland geology puzzles, The Hayward fault. You can follow any responses to this entry through the RSS 2.0 feed. You can skip to the end and leave a response. Pinging is currently not allowed. I found a good article on more recent fossil finds from the Irvington Gravels, published by the San Francisco water agency. These were dug up during an upgrade of the major water line shown as a dashed blue line in the map above. Excellent blog site! 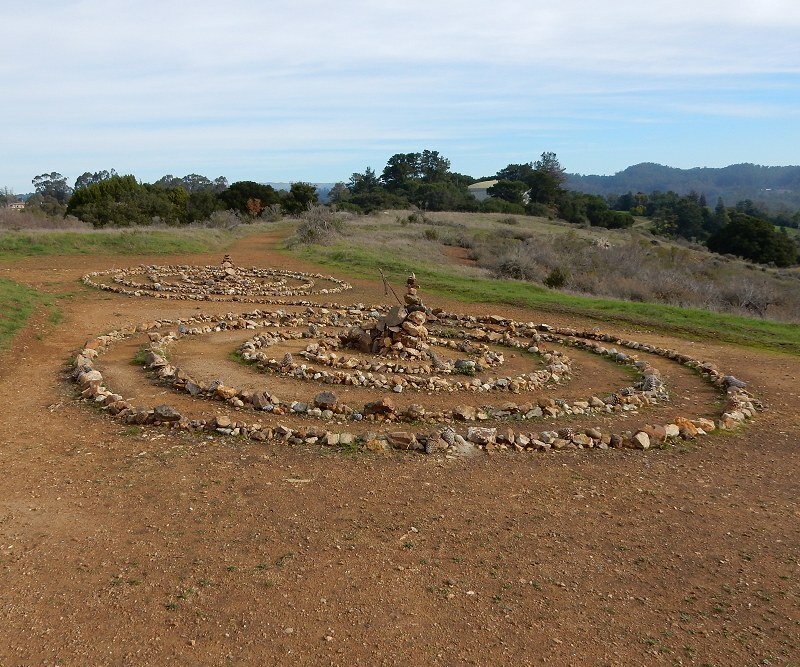 I’ve returned to the East Bay after almost forty years’ absence, and I was pleased to find someone who considers the area’s upper Tertiary-Quaternary geology worth blogging about. I’d almost forgotten about the laminar-banded chert of the Claremont Formation, one of the first specimens I collected in the ’60s as a budding geologist. Now that I’m back, I plan to reintroduce myself to this and other local lithologies. I’m also training to be a geo-docent at the Children’s Natural History Museum in Fremont. Hope to read more about the local geology on this blog. I understand your sentiments about collecting, but when a resource is anything but rare, methinks you esteem yourself a tad too highly- precious, perhaps? Me, I take it if it speaks to me, park or no! Expand beyond the suppressive indoctrination, the safety of the Goodie-two-shoes sheltered existence! Take it and live life! My readers can’t tell who you are, but I can, and someone in your position is the last person who should advise us to take whatever “speaks to you” from public lands.